This post with my Snowman Hot Chocolate Spoons: Easy Christmas Dessert Recipe is a sponsored post written by me as a member of the Collective Bias® Social Fabric® Community. It’s time to be honest. On one hand, I’m kind of in a tizzy about it already being Thanksgiving this week because it seems like just a couple days ago we were only a couple weeks into summer. On the other hand, I’m totally giddy because this is one of my favorite times of year! To continue being honest, a lot of my giddiness comes from being a total food geek and loving to make a variety of holiday and Christmas recipes and goodies to share with our friends and family. 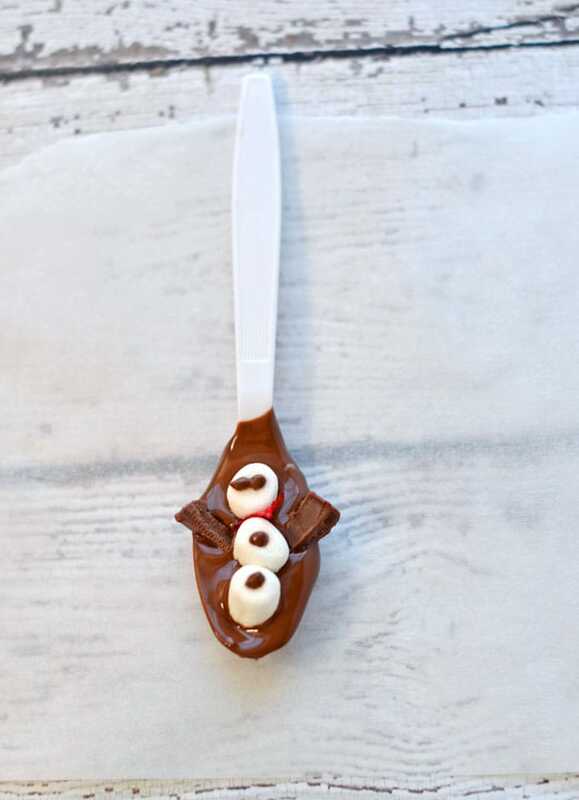 These snowman hot chocolate spoons are easy to make, kid-friendly, and also make great gifts. This year, things are especially busy for Mr. Savvy and myself, so I’ve been trying to brainstorm some Christmas dessert recipes that are easy and not overly time consuming, but that still look super festive, and, of course, taste delicious. Even though we live in the south, it can still definitely get quite chilly here, so I love having warm drinks through out the day like coffee and tea. However, the big kid in me still loves hot chocolate too. I fondly look back on my days as a child curling up by the warm wood fire with a huge mug of freshly made hot chocolate, often topped with a big handful of marshmallows. But, what really made hot chocolate special was when my mom would give me hot chocolate spoon to go with it. Mmm, mmm; talk about rich chocolaty goodness. With this memory as my motivation, I decided to give hot chocolate spoons a bit of a festive holiday flare by trying my hand at snowman hot chocolate spoons. I’m super happy with how they turned out and they certainly make a mug of hot chocolate, or even coffee, that much tastier and full of holiday cheer. They’re perfect to stir into a rich mug of hot chocolate while unwrapping presents to make the day just that much more special. I so love that you can just microwave this melting chocolate straight in the cup it comes in. While they may look a little time consuming, it actually goes rather quickly and is a great activity for the kids with a bit of adult help. One of my favorite products to use when making this hot chocolate spoons recipe is Baker’s Chocolate Dipping Chocolate. A couple of months ago we finally got a microwave after not having one for a few years. Truth be told, the biggest reason I wanted a microwave again was because melting chocolate is soooo much easier and faster. 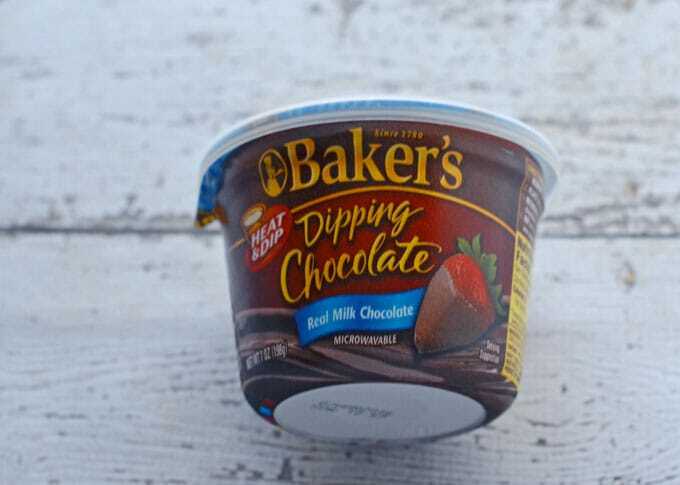 But, Baker’s Chocolate makes it even easier with their dipping chocolate, because you can microwave it right in the cup! As you guys know, I’m all about less dishes to wash. Some of my favorite ingredients to use in this recipe. 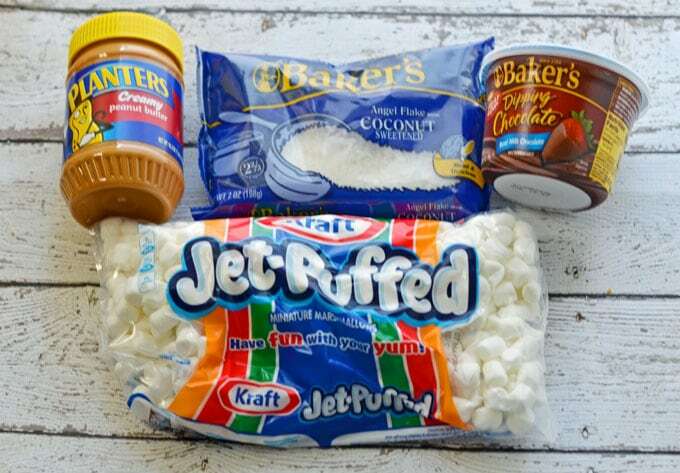 Some other ingredients I use are chocolate chips to make the eyes (and buttons if you’d like), bar chocolate to make arms, mini marshmallows (I always used Jet-Puffed) to make the snowman, and flaked coconut (love Baker’s again). I also love vanilla in hot chocolate, so I often add a bit to the chocolate before dipping. Plus, I sometimes feel like changing things up just a bit and will stir in a couple tablespoons of peanut butter (Planters make a perfect creamy variety) into the chocolate before dipping for a bit of a twist. So good! I also love shopping for all of these ingredients at Walmart because I can just head over to the baking aisle instead of having to go on scavenger hunt all over the store. You can see what my shopping experience was like by checking out my album for this recipe shop on Google+. 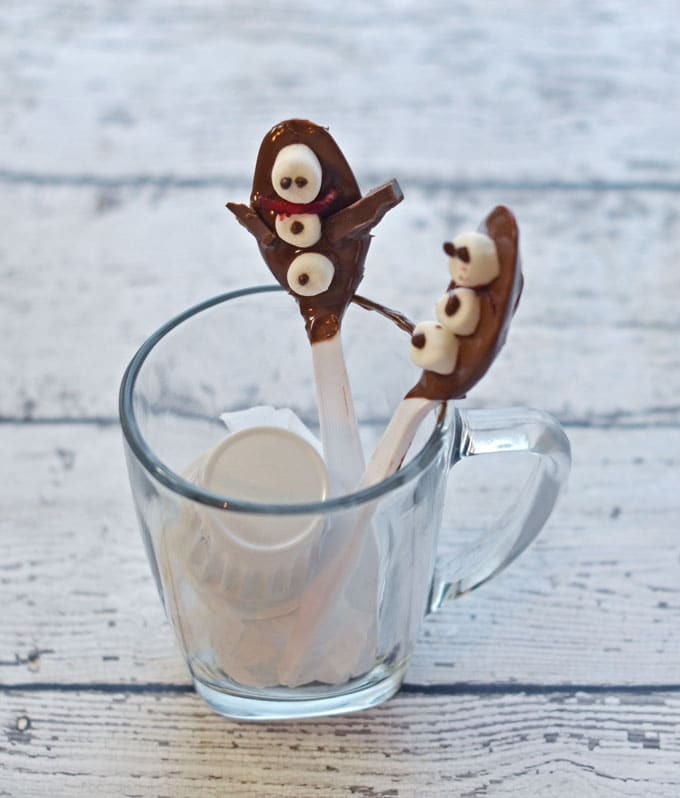 The Snowman Hot Chocolate Spoons also make for a great gift when placed in a mug with a hot chocolate packet or K-cup. Just wrap in cellophane and tie with a ribbon! This snowman hot chocolate spoons recipe is great to enjoy with a mug of hot chocolate while opening presents or after a long day of playing in the snow. Dye flaked coconut in your desired color(s). Remember, a little bit of coloring goes a long way and juice should only be used if you're consuming them the same day. You can do this the day before if using coloring so the coconut has a chance to dry and be less messy to work with. Melt Baker's Dipping Chocolate as per package instructions. Stir in 2 Tablespoons of peanut butter and vanilla, if desired. Dip spoons into chocolate and set on wax or parchment paper. Don't fill all the way or you'll have a bit of overflow when you put the marshmallows in. While the chocolate is still warm, gently press in 3 marshmallows in a vertical line in the shape of a snowman. Leave just a bit of room between the head and middle piece for the scarf. Place coconut scarf between the first and middle marshmallow. If you have cooking tweezers, they can be helpful with this. 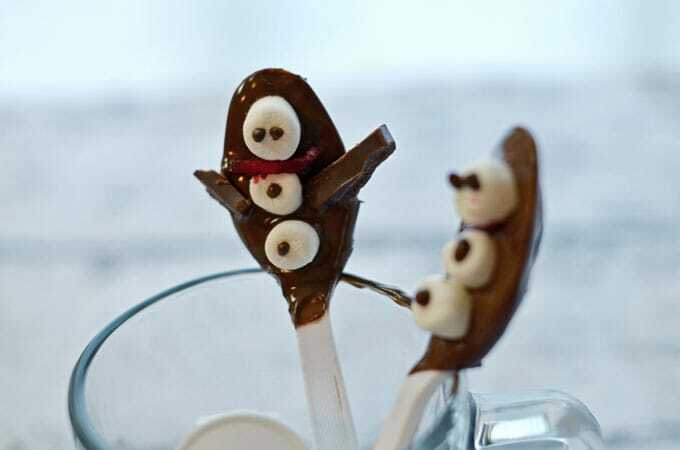 Place some of the leftover melted chocolate into a piping bag or a small plastic baggie with the corner snipped off and pipe on eyes and buttons. 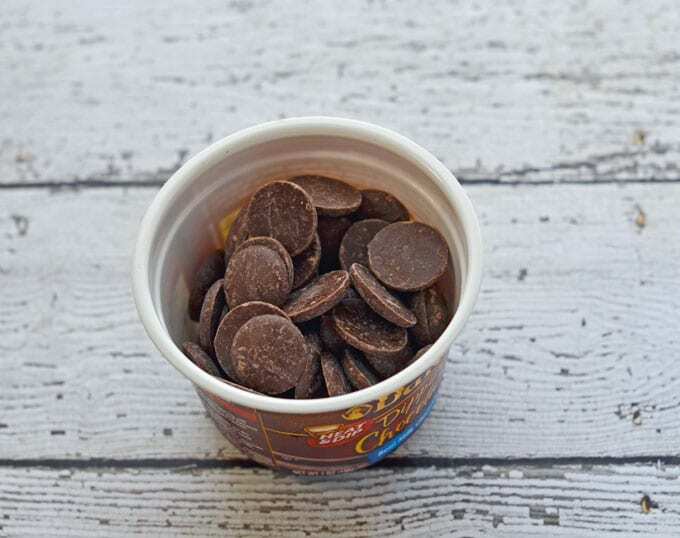 You can alternatively put a bit of melted chocolate on the flat side of mini chocolate chips. I think they look a bit better piped on. If desired, place the chocolate stick "arms" out from the middle marshmallow section. Place regular-sized chocolate chip on top of the snowman's head as a hat. Place spoons back on parchment and allow chocolate to finish hardening. Enjoy immediately, wrapping any leftovers to use as desired. This recipe is very adaptable to different flavors. Just add extracts, etc. to the chocolate before dipping such as instant espresso, mint extract, almond extract, ground cinnamon, etc. I first attempted these last year with mini chocolate chips, but I think piping the chocolate is easier and looks better. 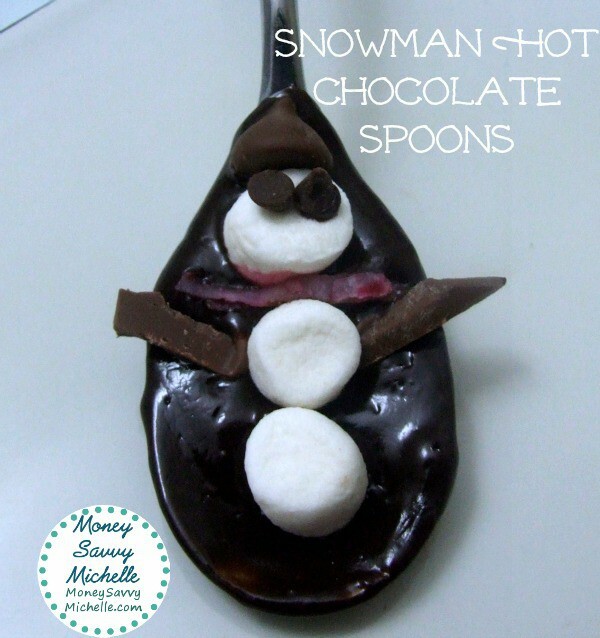 I hope you enjoyed this Snowman Hot Chocolate Spoons Recipe – what’s your favorite hot chocolate memory? awww, how cute – and even better – how easy! They look complicated! I’d love to try this while it is still cold out and hot chocolate and snowmen are fun, fun, fun!! How clever, the kids would love this little guy with their hot coco!